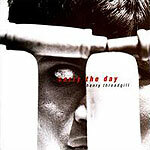 CD review: "Carry the Day"
This review first appeared in the March 24, 1995 issue of the North County Blade-Citizen (now North County Times). How to define Henry Threadgill? How about "busy jazz"? There are dozens of different themes swirling about in a typical Threadgill composition, and at first listen it can seem cacophonous. But when you follow any one instrument, it comes clear that all are complementing and supporting one another. Threadgill's own saxophone work is impassioned and powerful; his lead lines generally form a progression that build loosely on the theme and then strike out in bold new directions. His band, Very Very Circus, has an unusual instrumentation: two tubas, French horn, guitar, rhythm section. for this session, Threadgill also added African percussion and an accordion. The African rhythms (and vocals) bring a more obvious structure than prior Threadgill recordings. Still, this isn't casual listening  you have to pay attention to hear what's going on, to pull order from seeming chaos, to define melody in dissonance, to find the poetry of the individual in its relationship to the whole. The challenge of Threadgill, though, pays off for the listener willing to put in a little effort.